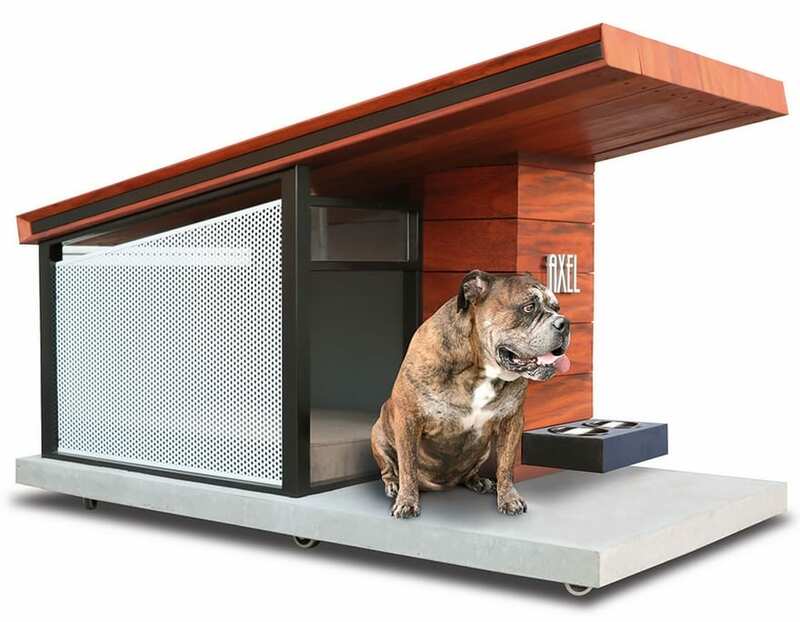 This is the personalized doghouse built with a passive solar design worthy of a spread in Architectural Digest. With roots in Antiquity, passive solar design cools structures during the summer by minimizing solar gain and heats in the winter by capturing and storing the sun’s energy—all without the use of photovoltaic panels. Evoking the passive homes designed by Frank Lloyd Wright, this doghouse’s Brazilian teak roof has a long overhang that blocks the high angle of the summer sun from reaching the front window glass. A transom built above the window and into the top of the rear wall enables proper air circulation while a removable perforated side panel provides additional ventilation that keeps a canine cool. In the winter, the window’s glazing allows sunlight to pass through and be absorbed by the concrete floor to provide a cozy repose for a dog to snooze. Includes a 3 1/2″-thick Jax & Bones memory foam pillow, built-in twin stainless steel pet bowls, and a personalized, raised-letter sign that identifies the occupant.